A Diamond Select Toys release! The Spider-Woman of Earth-65 is taking the Marvel Universe by storm, whether she's fighting alongside other spider-heroes against the Inheritors, or playing with the Mary Janes in a battle of the bands! 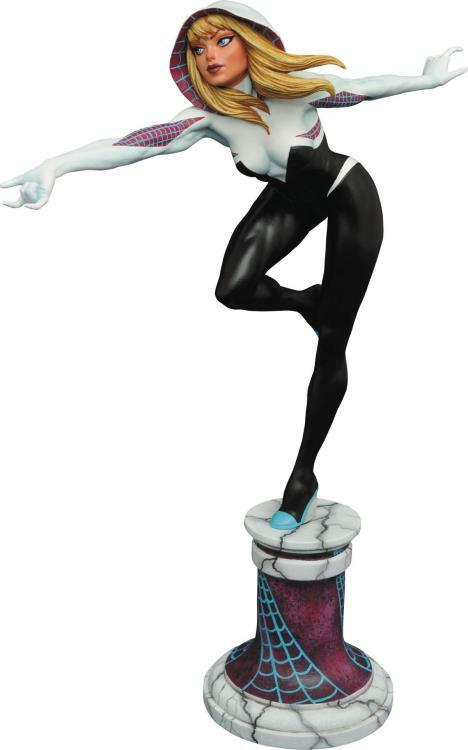 This 12-inch scale statue of the unmasked "Spider-Gwen" shows her alighting on a pillar, preparing to shoot a webline while balanced on one foot. Sculpted by Clayburn Moore, this resin statue is limited to an edition of 3,000 pieces, and comes packaged with a certificate of authenticity in a full-color window box.